Sprawling over a vast area of 572.90 sq km, Nagarhole National Park is an important part of South Asia's largest forest-the Niligiri Biosphere Reserve. Pleasant climate, crisscrossed by serpentine rivers and streams, beautiful valleys and dense forests- all are sufficient reason to make Nagarhole national park India's one of the most celebrated paradise of wildlife. 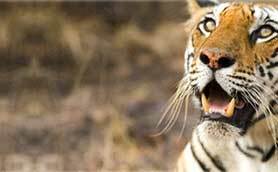 Tiger and elephant and India's best adventure site are quick attraction bringing thousands of tourists from all over the world every year to the Nagarhole national park. Nagarhole National Park is a part of the Niligiri Biosphere Reserve which consists of 2400 sq km of forest and include other parks like Bandipur National Park, Mudhumalai Wildlife Sanctuary and Wayanad Wildlife Sanctuary. The northern part of the park consists of moist deciduous forest while south-eastern part is dominated by dry deciduous forest. The park is drained by several rivers and tanks forwarding an ideal base for wildlife. 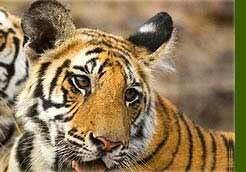 Nagarhole National Park is worldwide known for harboring a very diverse kind of animal species. 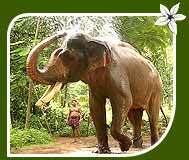 Elephants and tiger are the main attractions of Nagarhole national park. Other animals are panther, chital, sambar, sloth bear, dhole, Nilgiri langur, smooth-coated otter, common palm civet, stripe-necked mongoose, jungle cat, wild boar, golden jackal, Indian grey mongoose, striped hyaena, rusty-spotted cat, ratel and Indian spotted chevrotain. Some commonly seen reptiles in the park are lizards, Cobras, crocodiles, kraits, pythons and vipers. There are around 250 bird species found in the park. Some prominent bird species include babbler, bee-eater, bulbul, dove, moorhens, Brahmini kites, crested hoopoe and serpant, Malabar pied Hornbills, alexandrine, peacock, paradise fly catcher, minivets, woodpecker, warbler, great Indian reed, eagle, crested hawk, golden-back parakeet, the southern tree pie etc. Jeep safari is the prime medium to explore the flora and fauna wealth in the Park. Forest Department provides jeeps and guide who will help you to truly enjoy the forest. There are some towers built inside the forests. Necessity climb the tower. It will offer you a panoramic views of the whole forests and hideouts of the forests. 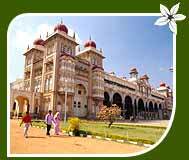 Mysore-the city of palaces- is the nearest city having many historical and religious attraction. Nagarhole National Park is well connected by road to the prominent cities of Karnataka state like Madikere (90 km), Mysore (96 km) and Bangalore (220 km) and can be accessed by frequent buses plying between these cities. Mysore is the nearest railhead offering rail services to all major south Indian cities. Bangalore is the nearest international airport with efficient domestic and international services. There are 2 rest houses managed by the Forest Department. Some private wildlife resorts and lodges also available near the park offering quality accommodation and hospitality. You need to book it in advanced.